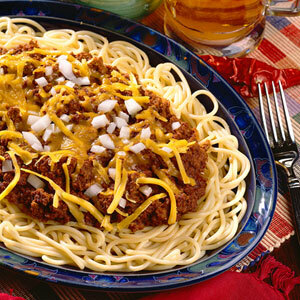 Cincinnati Chili is a great dish that is widely available in Ohio and the Northern Kentucky area. If you have managed to taste and enjoy this amazing dish, but are having difficulty in finding it at any of the restaurants in your area, then you can easily make it at home – all you need is the time, the ingredients, and a little bit of effort. Take a large pot and put your ground beef in it. Place it over medium heat and wait for it to start browning. Here, you may be required to use cooking spray if the beef is extra lean and sticking to the pot. Next, add the peppers and onions as the beef is browning. Let them cook for a few minutes as you prepare your other ingredients. With the kidney and black beans, it is best to rinse them in cold water using a strainer. Getting the juice off the beans will offset a lot of the negative side – effects that traditionally come with eating chili. When you are ready, add in the beans to the mix along with the canned diced tomatoes. Cover the large pot and turn the heat down low. If you have one, set your kitchen timer for 20 minutes. You can now boil your spaghetti during the time when you are waiting for the chili to fully cook. By the time you have your spaghetti ready and on the serving plates, the chili will almost be done. Serve the chili over the spaghetti. Without the cheese, this is known as two-way spaghetti. Adding the cheese is called three-way spaghetti. Serve it hot on the table and ask your friends and family members to enjoy.